The tanker Gaselys (above) traveled to Everett with extra LNG ordered because of the recent US cold snap. The Russian gas has finally arrived in Boston. 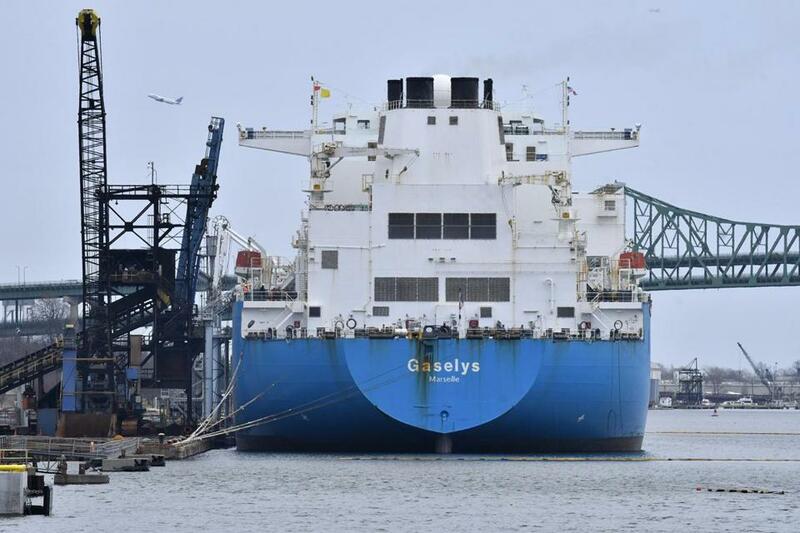 A giant tanker of liquefied natural gas that unloaded at the Distrigas terminal in Everett over the past two days included fuel from a plant in Siberia owned by a Russian company under US sanctions. Located far above the Arctic Circle, the $27 billion Yamal gas plant opened in December, and some of its first output ended up in the cargo that will be used to heat homes and generate electricity in the Boston area. The majority owner of the Yamal plant is a Russian company called Novatek, whose shareholders include an ally of Vladimir Putin, Gennady Timchenko. The US Treasury initially imposed sanctions that prohibited US companies from providing new financing to Novatek and another Russian energy firm in 2014, in response to what the agency had described as Russia’s destabilization of eastern Ukraine and its annexation of Crimea. Treasury officials did not respond to requests for comment about the arrival Monday of the tanker, the Gaselys. Since these particular sanctions involve just the money that Novatek could access, energy industry experts said they do not prevent Western companies from buying the gas produced at its Yamal plant. “The company that developed the project was sanctioned, but the gas itself was not sanctioned,” explained James Henderson, director of natural gas research at the Oxford Institute for Energy Studies in the United Kingdom. It’s unclear how much of the LNG carried by the Gaselys came from Russia because it was mixed with liquefied gas from other countries while stored temporarily at a UK facility. The owner of the Distrigas facility, the French company Engie, bought the fuel on global spot markets when the extreme cold spell earlier this winter sapped inventories and drove up prices of natural gas coming in by pipeline. “We needed an extra cargo to make up for some of the gas we sold because of the very cold weather,” said Engie spokeswoman Carol Churchill. The sanctions forced the Yamal’s developers to redo the plant’s financing and seek outside funders, including loans from Chinese banks. Novatek owns just over half of the Yamal plant, with the rest split among the French energy giant Total and two Chinese state companies. Jim Bride, president of Energy Tariff Experts LLC in Cambridge, said the acceptance of Russian gas comes as the United States is promoting energy independence and targeting exports to counter Russia’s grip on European gas markets. The importing of Russian gas into New England, he said, doesn’t help with this narrative. The Yamal plant is so far north that the waters around it are frozen solid for much of the year, and that required the owners to commission ice-breaking tankers that can sail into ice two meters thick. After anchoring off the coast for several days, the Gaselys arrived in Everett Sunday morning, Churchill said; it typically takes up to 20 hours for the ship to unload its cargo. This was the first shipment containing Russian gas at the Everett terminal in its five decades of operation, Churchill said. The company typically gets LNG from a more temperate place: Trinidad. The terminal had already accepted five shipments since mid-December, all from Trinidad. Some of the gas is fed into the region’s two main pipeline networks, while other gas is trucked in still-liquid form to storage tanks across New England. The terminal’s gas is also used for power generation. But in anticipation of increased demand this season, Churchill said another shipment of LNG Engie ordered that is scheduled to arrive in February from a French terminal will probably include gas from Russia.